House Minority Leader John Boehner (R-Ohio) on Sunday indicated that Congress may not be able to pass a massive stimulus as quickly as President-elect Obama and House Speaker Nancy Pelosi (D-Calif.) want. The GOP leader noted that he was confident earlier in the week that the measure could be passed by the Presidents Day recess but, after hearing Democratic criticism of Obama’s planned stimulus, he is now not sure if that target can be reached. He added that investing in infrastructure can be a component of such a plan as long as it is targeted. Wrong, Mr. Boehner. Americans can no longer afford our addiction to driving. Our automobile dependency is driving the country to bankruptcy. We can barely maintain our existing roadways, let alone expanded highway facilities As the global economy continues its rapid decline into possible depression, we will need innovation, not tired old thinking. Many bicyclists are excited about the pending inauguration of newly elected President Barack Obama, whom they believe will offer more support for transportation bicycling than notorious mountain biker George W. Bush. As a candidate, Barack Obama expressed support for bicycling, admiration for bicycle friendly cities like Portland, and is himself active as a bicyclist. So he could hardly be worse than the out-going single-track shredder. Infrastructure investments that include: retrofits to existing streets to make them safe for all users, as well as new trails that create comprehensive networks, cannot only create new jobs, but can help American families recover from the economic downturn and lay the foundation to address some of our nation's major crises, such as climate, energy, and health. -America Bikes member organizations have identified over 1.2 billion dollars of ready-to-go bicycle and pedestrian projects. -Bicycle and pedestrian projects are labor-intensive and require less expensive materials than road building projects thus creating jobs at roughly the same rate as highway repair. -By prioritizing Complete Streets projects, and by fixing existing roads to complete streets standards, this recovery bill invests not only in jobs, but also in projects that will not have to be retrofitted in the future. The current discussion of stimulus plans creates a great opportunity for bicycle advocates. But only if we push aggressively with our advocacy. 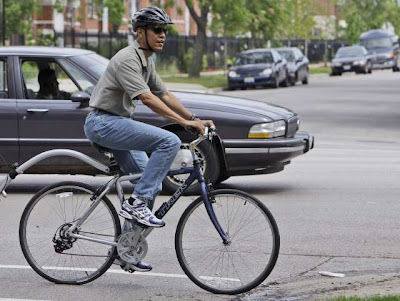 Obama may be more receptive to transportation choice than Bush. (Frankly--with Biden, Hillary Clinton, Lawrence Summers, Robert Gates--I see more continuity than change.) But Obama will be supportive only if pushed by a strong grass roots movement for bicycling, walking, mass transit, and especially passenger rail. Oh, my goodness - this makes me so mad! A fantastic way to improve our economy while improving the quality of Americans' lives in the long-run is to invest in active transportation infrastructure, especially cycling infrastruction. Reason 1,234,009,749 why I'm not a Republican. But can Democrats be trusted to take a real stand on the issue? Only time will tell. Perhaps people can point Boehner to the various studies that show that widening roads, after a short period of relieving congestion, often ends up increasing it. Maybe government can finally be convinced that building more roads (which take up and pollute more land even if no one drives them) is precisely the WRONG direction to go in. I think this is more of an issue of perception than it is of politics. To most Americans, Bike paths are used by families on the weekends to go joy riding. Many bike paths are created with no attention paid to how they can help meaningful transportation. Many are also not maintained like they're important routes of transportation either. Just last week I have to climb under a high way bridge to get around a flooded greenway. It stayed flooded for three days. Would they have built a road in a flood plain and not emptied it when it flooded? No, of course not, but then again, the bike path is for recreation. If I wasn't a cyclist, I too would be against bike paths as a part of the stimulus. Because before I became a bike commuter, I didn't know you could use the bike paths as alternatives to roads (though ours is poorly designed only only slightly useful. So instead of blaming politics and partisanship, maybe we need to look at how people perceive what we're talking about. The quotes rep said "if we’re talking about beautification projects, or we’re talking about bike paths..." See? He doesn't consider them efforts at transportation. Is he doing that intentionally? Or does he just not know? Either way, what we should be doing is explaining to others how Bike Paths can help ease congestion and improve transportation issues, not just scream "I want bike paths!" Do we want to be more dependent on the erratic oil markets and MidEast leadership or on ourselves? To ignore the low cost, healthy choice of commuting on cycles will only lead to greater costs for everyone tomorrow. Infrastructure should be designed to increase independence and self reliance, not the opposite. Educating the public and police departments on STR issues would be a great first step. Federal grants should be prioritized to help communities that can prove their commitment in promoting cycling infrastructure. The misperceptions are serious ones, both that wider lanes are what we need and that bike paths are superfluous. Alas, I'm not sure most Democrats understand any better. They may just be more "accepting" - as in they won't put their misperceptions into words, but they still think cycling is recreational or something you do until you can get a car. Have you been following the auto industry crisis. I've heard and read that it needs sales of 15 million new vehicles in the United States to remain viable, which means Americans must have well more than one vehicle per registered driver. Might Americans want to shift some of their declining income (as each generation is made worse off by the one before) to something other than multiple vehicle ownership? That is something that America evidently cannot afford. Missouri Senator Clair McCaskill (DEMOCRAT) has Obama's ear on this issue and she opposes any bicycle/pedestrian projects as well. Both sides are clueless. The only people more clueless are democrat bicyclists who think their side gets it. I'm a Republican, but I gotta say the Republican party is so short sighted with this and other environmentally responsible initiatives it makes me embarrassed to associate myself with the party. I'm doing my part to put as much pressure on Republicans to "see the light" on these issues....I figure we can all benefit more by having both major parties working on these important matters. 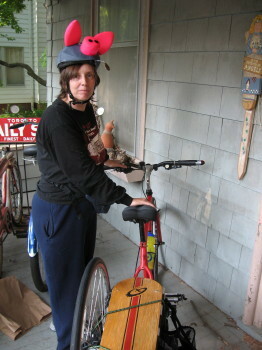 Not one bicycle project was selected for funding through the Ohio federal stimulus projects announced today. The suballocated money to the Metro Planning Orgs will hopefully contain bicycle expansion projects but the State government needs a clue. Yeah it's a shame, but it's so hard to get anyone to care. Our cities are so spread out that people are almost forced to drive. Hopefully high energy prices force people to start using alternatives when feasible. It makes me mad too, I rent bikes in NYC and I believe that cycling is the most effective way of transportation in NYC and all other very urbanized areas.